This is probably going to be my last garden blog post for a little while as the creative phase is pretty much over for this year. Now I’m just going to sit back and enjoy it. At the weekend I finally lifted the pallet garden into place. My goodness it was heavy! My daughter and I just about managed to walk it up to the wall and we leaned it there at a slight angle. It looks great! The pallet leans at a slight angle to try to reduce fall-out, and so that it won’t pitch forwards and fall (scary thought). 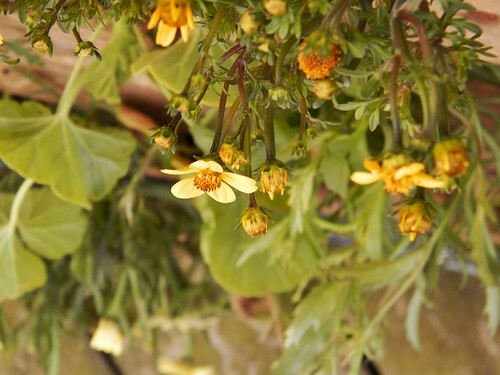 A few flowers are already emerging – some marguerites, marigolds and another yellow flower I have lost the card for so can’t remember what it’s called. The gaps between the plants are larger than they could have been – lesson learned for next year. That’s a solar light and there are two more at the top. 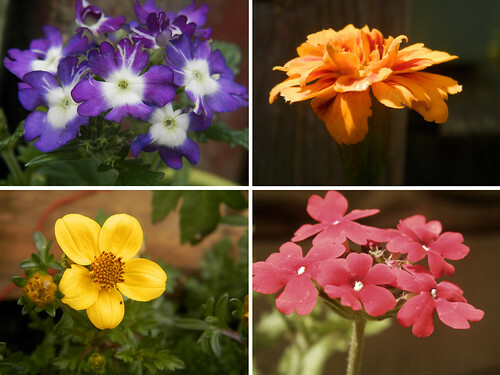 There are also petunias, ageratum, alyssum, lobelia, dianthus, geraniums and verbena in there. I’ve watered it twice since it was lifted into place and I’m noticing some soil erosion so I’m being as careful as I can be. If I’d stuffed the plants in more tightly as I should have done (didn’t read the instructions as I went along – stuffed them in along the top and spaced them elsewhere) this would be reduced. Still, they should hold and I can keep an eye on them. The plants will have to change direction now, having been moved 90 degrees. Most of the flowers are starting to emerge – the orange and yellow ones are leading at the moment. Elsewhere in the garden, some of the verbena and lobelia are venturing into bloom, and several of my rescuelings (50p bargains from the ‘almost dead’ shelf at the garden centre) from previous years are maturing nicely. 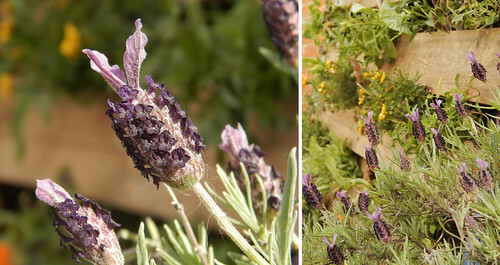 I have two lovely lavenders, a sage that’s flowering now, and various trailing flowers which will come back year after year. A lavender rescued from near death two years ago provides some maturity. Verbena, marigold and the one whose name I can’t remember. 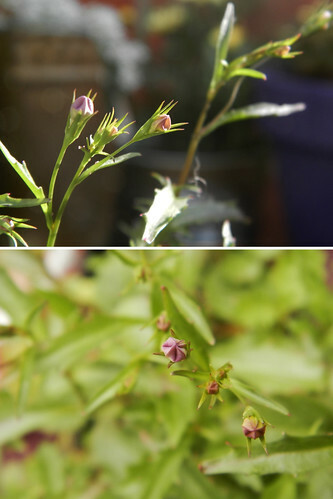 I bought loads and loads of lobelia – they’re one of my favourites and they flower for months. They should be out this week. 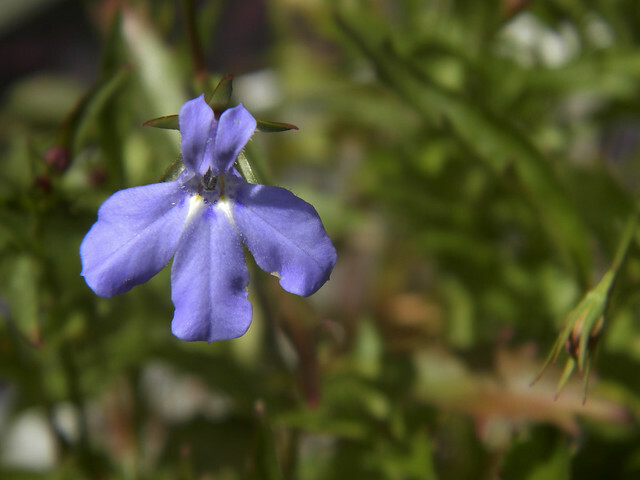 Tiny lobelia provide wonderful sprinklings of colour – and they’re beautiful close up too. This was the only one out on Sunday. 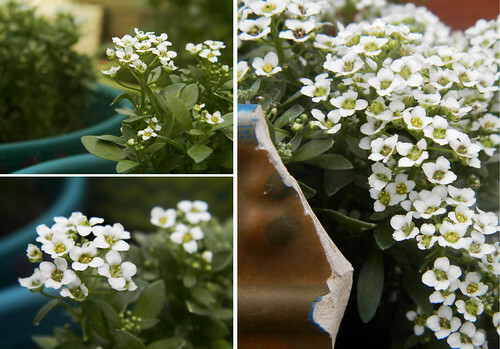 Alyssum growing in various places – including a boot-shaped pot that got smashed in the wind last year. The way this plant grows quite suits the uneven shape. While the pallet was settling down after the shock of its 90 degree shift, I got to work painting the terracotta troughs I hadn’t had time to do last weekend. 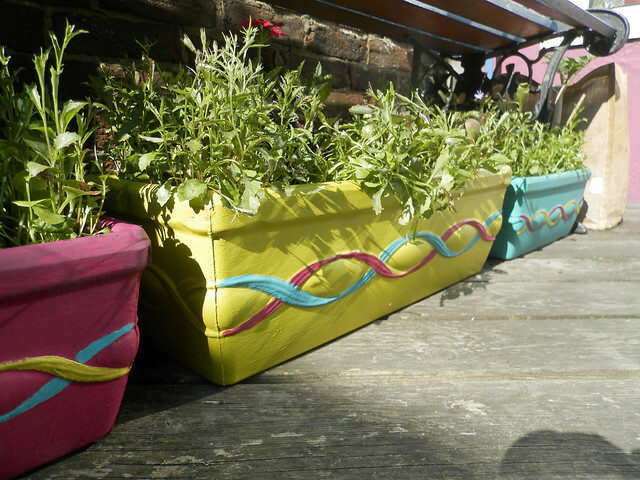 Again I very quickly painted decorations – this time using the twisted pattern moulded into the shape of the troughs. They don’t bear close inspection but they really brighten up the corner. Simply mixing up the colours makes everything go together. There are potatoes growing in the jute bag you can just see on the other side of the bench. And the bench finally got its facelift. 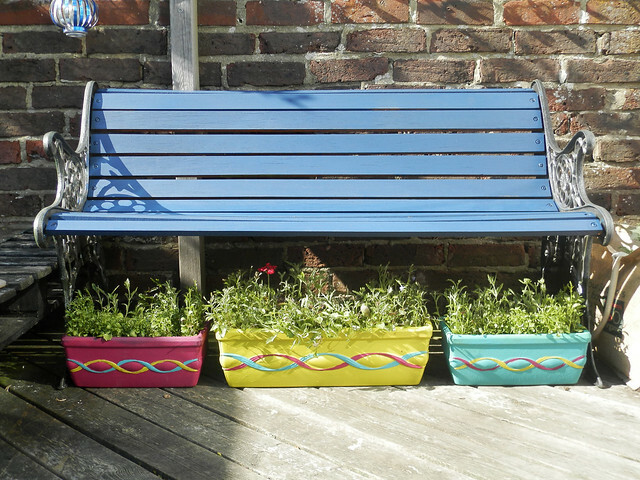 For this I used wood preservative paint (Cuprinol Garden Shades – Iris). I’ve used this colour elsewhere in the garden, on the frames of some of the mirrors I have around the place. So another afternoon’s work with striking results. Even though I won’t be doing a garden blog for a while, I will keep you updated as the flowers come out and post some photos of the pallet in full bloom. 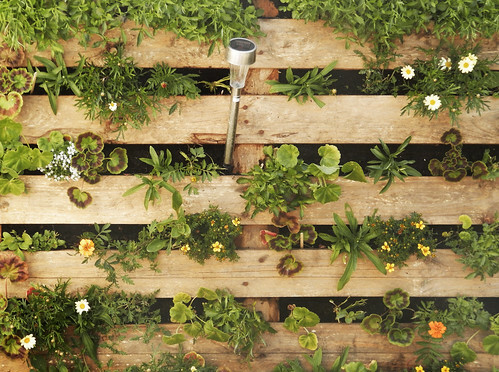 I’d love to see your garden creations, and if you’ve made a pallet garden I’m eager to hear your maintenance tips. I’m definitely keen to do this again next year. So do leave a comment and why not sign up to hear about updates as soon as they’re posted. Congratulations. How exciting for this to be the garden “lift” day. Been enjoying the process and I wish you much luck. Thinking the gaps should be fine as long as there is not a heavy rain to move more soil before the foliage fills in and the flower roots spread. Continued success. Thanks Joey – I think you’re right about the gaps. I’ll just watch them carefully and be gentle with the watering. I’m so chuffed with it.